Singapore, 3 October 2018 – YCH Group, Asia Pacific’s leading integrated end-to-end supply chain management and logistics partner joined in the signing of the Supply Chain and Logistics Strategic Collaboration Memorandum of Understanding (MoU) with Commodities Intelligence Centre (CIC), together with Global eTrade Services (GeTS), PIL Logistics, WLNA and Zallsoon Information Technology (Wuhan) Co., Ltd. Under the MoU signing, YCH will provide logistics services to CIC, and capture value from cross-border commodities, that could include sugar, cotton and silk, trade flows through integrated supply chain activities such as shipping, freight-forwarding, warehousing and others through the e-trading platform. While the integration of supply chain activities will be done through GeTS’ platform, CALISTA, the parties under this MoU will also look into the exploration of trade and customs compliance solutions provided by the platform. This partnership will open up new opportunities for Singapore’s logistics players to capture value from the cross-border trade flows and supply chain activities that do not come through Singapore. 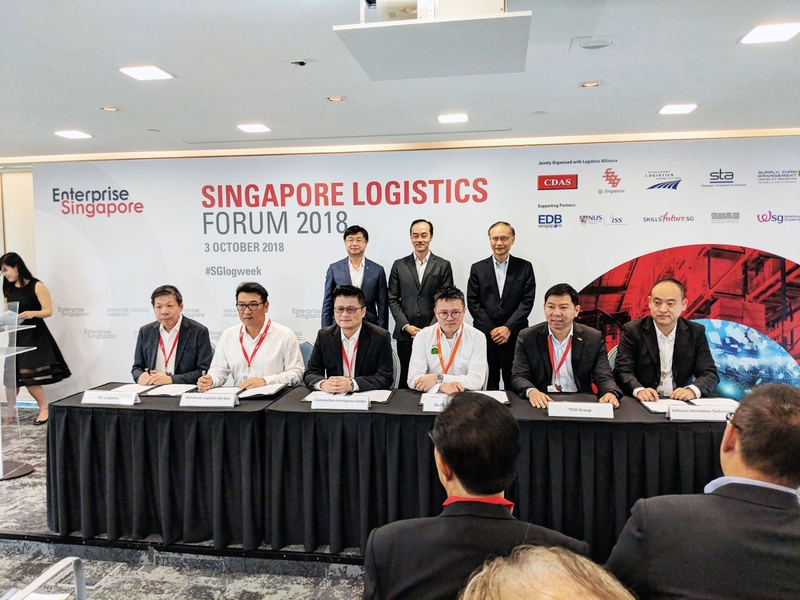 The signing ceremony was held earlier on today, witnessed by Senior Minister of State for Trade and Industry, Dr Koh Poh Koon at the inaugural Singapore Logistics Forum 2018 organised by Enterprise Singapore. Mr Jimmy Ng, General Manager and Head of Cold Chain Unit of YCH (seated second from right) at the signing of the Supply Chain and Logistics Strategic Collaboration MoU. CIC is the JV among ZALL, GeTS and SGX. It operates a global B2B commodity trading eCommerce platform, in which buyers and sellers can make a deal, arrange logistics, financing and custom declaration and compliance, and are able to track and trace the status of the delivery and clearance. GeTS is the proprietor of the suite of online services known as GeTS Global eTrade Services (‘GeTS’) which enable electronic data transmission and validation of Customs, cargo manifest declarations between the declarants, value added service providers and the Customs authorities. GeTS also provides supply chain orchestration platform (CALISTA). PILL is focused on powering its customers’ moves into Asia. Besides its unique capability in China, PILL is also entrenched in various South East Asian countries, with joint ventures and strategic partnerships across the region. PILL's parent company, Pacific International Lines (Pte) Ltd, is a global transport and logistics company with over 52 years of operating history. WLNA is a logistics solutions provider offering a complete and integrated suite of supply chain management services, including dry and refrigerated warehousing, distribution and logistics consulting. Founded in 1999, WLNA has evolved to be Singapore’s leading cold supply chain logistics company. We serve the food and beverage (F&B) and quick-service restaurant (QSR) industries including traders, wholesalers, food manufacturers and supermarket retailers. ZALLSOON is an online forwarding logistics platform, providing one-station logistics services including city express, intercity freight, and cold chain delivery. With the supporting platform of ZALL intelligence trading ecosphere, and the cooperation partners, ZALLSOON is able to provide accurate truck-cargo matching service with the intelligent dispatching and management, for the sake of improving transport efficiency, and the freight market upgrading as well.